Andy's treasure hunting cafe and metal detecting blog: New Deteknix Quest Pro metal detector review. 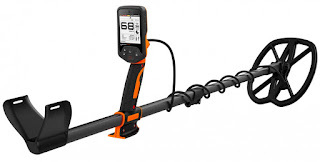 Deteknix Quest Pro metal detector review. Hi all it has been quite some time since I last put up a blog post, today though i have something to write about! nasty and sore blisters and itchy patches on my hands and face and I just was just not up to making a video showing the new detector because of it. The Deteknix Quest Pro is a new metal detector to hit the market and is in the mid price range which I believe around £499 to buy brand new here in the UK (prices may vary depending where you are from) and it comes with loads of cool accessories. As standard you get an amazing set of wireless headphones, diamond digging tool, quality finds pouch and also a Deteknix baseball cap plus obviously the Deteknix Quest Pro metal detector! I found the Quest pro easy to put together out of the box and it has a very sturdy, well built feel to it with some really nice touches along the way. One of the nice touches is the way that you can undo three small screws in the base of the control box and then adjust where the control box sits on the stem with a sliding motion, meaning that no matter the length of your arm you will be able to find a perfect comfy position. The Quest Pro comes with an inbuilt rechargeable Li-Po battery which I believe gets around 20 hours of use between each charge. The metal detector coil is a 9x5 inch turboD style coil which feels of good quality and is very solid. Upon turning on the Deteknix Quest Pro the menu is easy to use and navigate with the soft to touch buttons and even the most novice of users will be able to work out how to set it up in no time at all. I have made a little un-boxing and review video below which i hope you enjoy and thumbs up and share. As they say the proof is in the pudding, so I will hopefully be out putting the Deteknix Quest Pro through its paces on one of my metal detecting sites, subscribe to my YouTube channel to be kept up to date with further reviews. Here is the Deteknix Quest Pro review video I made.